Colloid Journal (Kolloidnyi Zhurnal) is the only journal in Russia that publishes the results of research in the area of chemical science dealing with the disperse state of matter and surface phenomena in disperse systems. The journal covers experimental and theoretical works on a great variety of colloid and surface phenomena: the structure and properties of interfaces; adsorption phenomena and structure of adsorption layers of surfactants; capillary phenomena; wetting films; wetting and spreading; and detergency. The formation of colloid systems, their molecular-kinetic and optical properties, surface forces, interaction of colloidal particles, stabilization, and criteria of stability loss of different disperse systems (lyosols and aerosols, suspensions, emulsions, foams, and micellar systems) are also topics of the journal. Colloid Journal also includes the phenomena of electro- and diffusiophoresis, electro- and thermoosmosis, and capillary and reverse osmosis, i.e., phenomena dealing with the existence of diffusion layers of molecules and ions in the vicinity of the interface. 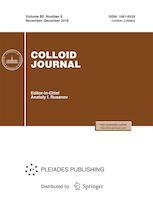 Colloid Journal Institute is a peer reviewed journal. We use a single blind peer review format. Our team of reviewers includes over 110 reviewers, both internal and external (80%), from 13 countries. The average period from submission to first decision in 2017 was 20 days, and that from first decision to acceptance was 20 days. The final decision on the acceptance of an article for publication is made by the Editorial Board.